← May the Five Elements Remain Strong & Harmonious! Greetings! It is my pleasure to write to you today to share some news with you. Today, May 5th is the first day of the Sidpe Gyalmo Bum Tsok at Menri Monastery. This is the first Bum Tsok offering of the year 2017, and it will last one week. All monks, nuns and lay practitioners (ngakpas) will make a total of 100,000 offerings to Sidpe Gyalmo and all the protector deities of the Yungdrung Bon. We will accumulate 100,000 of each of the offerings of the five senses, namely flowers, butter lamps, water bowls, incense and torma cakes. We will also offer the Nam Gye, which includes zug, dra, dri, ro, reg cha, bon and ter. The reason for making 100,000 offerings is that the retinue of Sidpe Gyalmo is composed of 100,000 beings, so we should make one offering for each one. The purpose of the Bum Tsok offering is to bring peace, health, prosperity, and happiness to all sentient beings. There aren’t any specific sponsors for the Bum Tsok. Anyone who wishes to contribute can do so for their own benefit or for the benefit of all sentient beings. The Bum Tsok also cleanses one’s obstacles, both inner and outer. Outer obstacles are related to the five elements, disasters, and problems caused by harmful spirits. Inner obstacles are problems such as depression, anxiety, and fear, especially when there are no external causes. The real causes are our karmic traces and tendencies carried over from our previous lives. Offering Bum Tsok to Sidpe Gyalmo is very helpful to clear away such obstacles. A common saying in Tibetan is “Gyamtso chu tik drel wa.” A literal translation could be “A drop of water connects with the ocean.” The meaning is that regardless of the size of our donation, our offering connects with and merges with the great ocean of offerings of the collective, and helps to increase its great virtue. 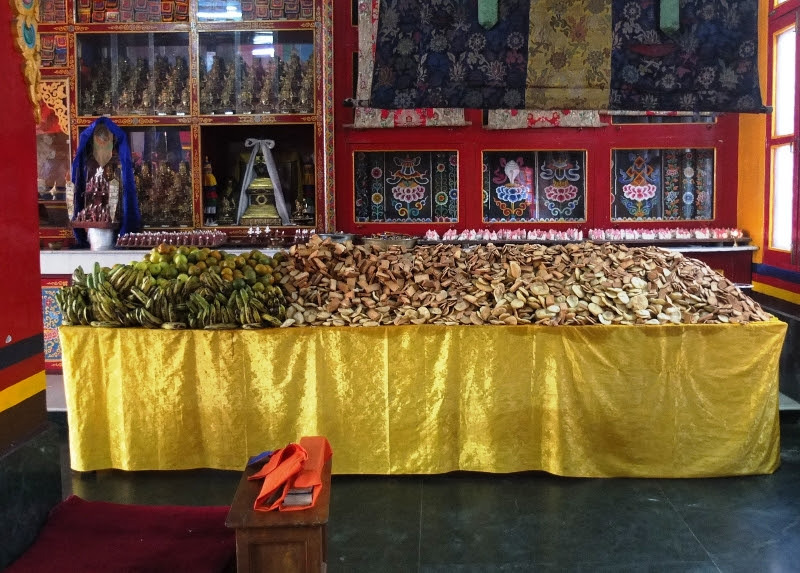 To those of you who would like to make an offering for yourself, for your family, or for all beings, the best way is to do so through Khyungdzong Wodsel Ling. All offerings received by May 09 will be forwarded to Menri Monastery for this event. All money received after that date will be held until the next Bum-Tsok. These special offerings are only done once or twice a year so please send your offerings ASAP. Posted on May 6, 2017, in Prayer and Ritual, Uncategorized, Yungdrung Bon Monasteries. Bookmark the permalink. Leave a comment.